First it was the horror of data roaming charges that stopped me texting home. Then the time difference set in – when I am free to text, my friends and family are often asleep or busy. And now? 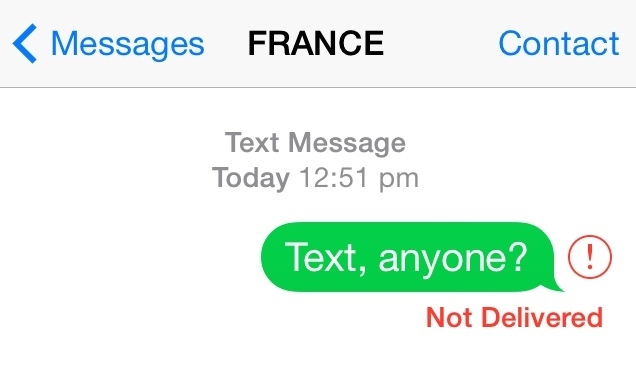 Well, now it’s a French conspiracy to cure me of my texting addiction altogether. There are 65.7 million people living in this country and not one of them wants to text me. The first clue came from the young electrician on his third visit to our crumbling but lovely Provençal home (“Bien venue à France,” grinned our house manager, Mme E, toasting us over a glass of rosé. Our anxieties melted with every sip). The expression that flashed across his face made me wonder whether I had accidentally offered him sexual services. I put it down to a young man not wanting to exchange texts with a middle-aged foreign woman with time on her hands – but it’s wasn’t just him. The fridge repair guy who is coming back in 14 months with the flux capacitator he’s ordered from Betelgeuse (I think that’s what he said) will not be texting me when it’s ready. He’ll phone. Your child gets invited to a birthday party? Pick up the phone. Want to meet your new French teacher? Pick up the phone. You text (or email) someone? They phone you back. I’ve seen French people texting. I’ve seen French people texting and smoking and driving extremely narrow roads very quickly and looking nonchalant all at the same time. But they won’t send texts to me. It’s as if there is a secret French agency targeting foreigners who are avoiding speaking the Mother Tongue. That’s what this is about, of course. Avoidance. I practise French every chance I get face-to-face but telephone calls? All those words bumping into your ear drum without a single facial expression or gesture to help make sense of them? Too hard. Well worth avoiding. Err, well, yes, apart from every muscle in my body bracing for the strain of understanding French without visual clues. To be fair, I haven’t had a bad phone call with Mme E yet. She slows down to 120 words per minute, speaks clearly and makes sure I understand before continuing. She’s made no secret of being part of the conspiracy. On the very first day we arrived at this house – when she welcomed us with her kisses and smiles and banquet of home-made madeleines and sweets and soft drink and rosé – Mme E promised faithfully that she would speak only French to us and our children. That way, she said, we would all learn faster. True to her word, she is relentlessly positive and will only rarely admit defeat and say: “Pardon Kah-ren, je ne comprends pas (Sorry Karen, I don’t understand). Her amusement made me realise I was shouting at her in English (also I could hear Sabbatical Man and our French teacher Mme N cackling away at the kitchen table like a couple of grands poulets). I clapped my hand over my mouth while Mme E smiled encouragingly. Gradually, I have become less attached to my phone. I still search for it when we go out because I want the map and French dictionary – but I have fallen out of the habit of texting. I miss those inconsequential texts from friends: “Walk?” “You home?” “Anyone else ready to murder their children?” But that’s more to do with missing my friends. I miss real-time text exchanges with my sister-in-law who has a delicious new baby and toddler but that’s more to do with wishing I could do more for her. I miss my Dad’s random texts. When I think about it, Dad always put “urgent” in his texts because back home I never answered the telephone and he knew it. It had got to the point that if you really needed me, you would text or email me, so why bother picking up? I really didn’t think I texted too much. I rarely had extended text conversations with friends – one of us would pick up the phone if it started getting complicated or wordy – and the people I texted most were the people I saw most, so it wasn’t anti-social. On the other hand, I did seem to be constantly texting. It is so efficient for quickly confirming arrangements, giving an update, asking a question or getting a group of people together without going through the time-consuming “Hi it’s me” chit-chat. In the months leading up to our departure – planning the travel and logistics, renting the house out, packing up, packing suitcases, getting all our affairs in order as well as doing all the normal jobs a parent has to do – the efficiency of texting was a godsend. Now, though, life has slowed down in the way it must when your friends and extended family and community and commitments and houseful of stuff are on the opposite side of the world. Right here, right now, life is simple and revolves entirely around the five people who live in this house. Efficiency doesn’t seem as important, phone calls don’t seem such an inconvenience – just a challenge when they are in French. So maybe the texting itself was a symptom of that ever-present First World problem: being too damned busy. Don’t hate me for saying it, but the cure is heaven on earth. Post script. It arrived yesterday. “Coucou Karen:)!” A seven-line text filled with warmth and enthusiasm and wee emoticons (a smile, a flower, a sun, a cloud, an umbrella) confirming an invitation to coffee. I looked at it for ages. No, texting isn’t all about efficiency. This text represents the start of a friendship and it’s one of the loveliest I have ever received. I know! Very sweet. Thanks Nat. Wish you guys could teleport over – boys have been talking about Luca quite a lot – and cracking themselves up with little stories about him!